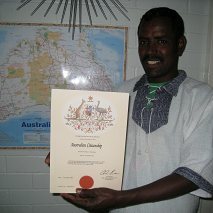 Ethiopian Geteye Teka Fantabil is thrilled to show his Australian citizenship after escaping death and being released from eight years’ captivity. In the year 2000, aged 28, Geteye was trained by Ethiopia’s government to go to war against Eritrea. He went to the outpost Zela Ambesa without really knowing the reasons. Many soldiers were injured but not treated while Geteye was lucky to survive after being left without water for two days. “I could not speak any more – an Eritrean soldier gave me two bottles and I drank them at once,” he said. At that time he did not know that he was going to be a prisoner of war for eight years in Eritrea. “First I went to the capital Asmara but I changed places three times,” he said. Geteye stayed four years in jail and another four years in captivity where he could not go further than the city border in Asmara. “They thought I was dead,” he said with a catch in his voice. The International Committee of the Red Cross came every two weeks and Eritrea’s government was obliged to treat the prisoners decently. “If you had any problems they fix them,” he said gratefully. A peace agreement was concluded between Ethiopia and Eritrea in Algiers on 12 December 2000. At the time of the signing of the agreement, the ICRC had registered and was visiting some 2600 Eritrean POWs in Ethiopia and some 1000 Ethiopian POWs in Eritrea. The releases come as a result of the peace agreement and are in line with the Geneva Conventions, which stipulate that prisoners of war must be repatriated at the end of active hostilities. Eventually 29 Ethiopian stayed in Asmara waiting for a new life whereas the rest came back to their country. “I was part of the 29 people,” he said. “When I arrived in Australia I called my family, they could not believe it was me,” said Geteye touched by the memory of his family. Now Geteye lives with his son in Brisbane after moving from Tasmania. “It was very very cold, I could not stay longer,” he said. When you ask him about the life in Australia he answers that he is very thankful for what has been done by the Red Cross, Australia and God but pointed out one thing. “It’s very sad,” Geteye said, confused. Since 2000 he has not seen his family, who are still in Ethiopia.